From time to time, I report on the Corruption Perceptions studies by Transparency International. It’s interesting to watch the trends, though I have to admit they’re slow-moving. In 2016, China caught up with India, and Myanmar – again is the surprise. So here are the results for 2016. In 2014, India ranked ahead of China for the first time since year 2000. 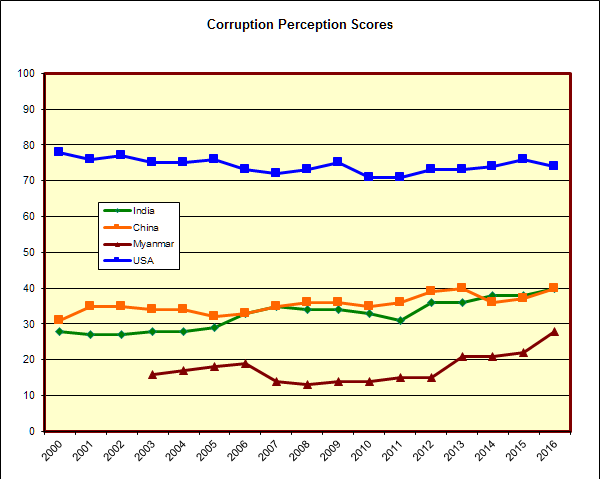 People thought India’s corruption environment was improving, and China’s worsening. I speculated that it might be the Modi Effect. In 2015, a year I skipped, China improved its rank and this year – it’s caught up. Both countries have a “normalized rank” of 45. The US is stable at 10. 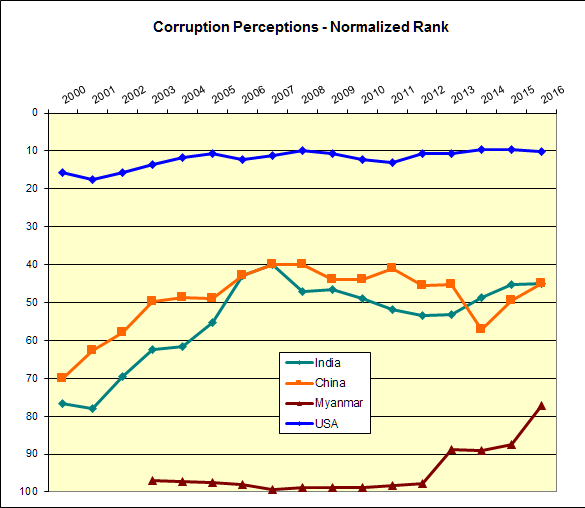 Since the number of countries Transparency covers changes each year, I normalize the ranks. You could think of them as percentiles. So a rank of 45 is around the middle of the pack. But then it seemed to flatten out, and 2014 and 2015 weren’t much different that 2013. This year, it’s shot up to 77. Again, not bragworthy exactly, but it’s pulled it out of the company of countries like Somalia and Sudan and North Korea, and is now in the same group as Guatemala and Papua New Guinea (and Kyrgyzstan). It’s climbed 12 ranks in 4 years. If it can do it again, it could in a few years be within shouting distance of other ASEAN countries. Thailand and the Philippines, for instance, both have a normalized rank of 57. 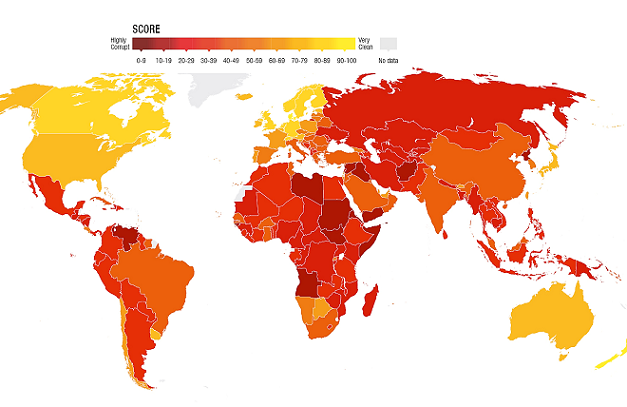 Here are the actual Corruption Perception Scores (out of 100, higher is better). According to the organization, the scores before 2012 are not comparable with the ones from that date onward. I’ve tweaked them so I think they’re good enough, but a data-purist might object. I’m using the US as a standard of comparison, and this shows it’s been quite stable. But it’s not the top of the world. The US only scores 74 (out of 100). It’s behind New Zealand and Denmark (90), Finland (89), Sweden (88), Switzerland (86), Norway (85), Singapore (84), Netherlands (83), Canada (82), Germany, Luxembourg, and UK (all 81), Australia (79), Iceland (78), Hong Kong (77) – though I don’t know why Hong Kong is separately reported, Belgium (77), and Austria (75). I wonder if the new government in the US will have an effect on corruption perceptions in 2017.